Getting paid as a chapter 13 debtor’s attorney has always proven somewhat difficult. Not the least of which is that the debtor typically must make chapter 13 plan payments from which counsel can be paid. Add on top of that the fee application, the fee order and the presentment been before the court and there are plenty of moving parts from which failure is imminent. Which brings me to the new court approved retention agreement to be used by debtor’s counsel and their clients in chapter 13 bankruptcy cases. The new agreement was announced on the bankruptcy courts website on September 12, 2016. The new agreement must be utilized in all cases filed on or after September 19, 2016. In essence, the judges for the bankruptcy court for the Northern District of Illinois have allowed a one week grace period from the time of said announcement to the time of implementation. My guess is that the court has no idea how many chapter 13 cases are in the process of being prepared which have the prior retention agreement already executed. In general, the chapter 13 retention agreement is a simple matter. 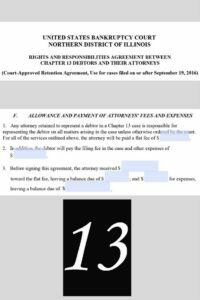 It basically states that the chapter 13 attorney and the chapter 13 debtor have entered into a retainer agreement. The agreement spells out what counsel will do as well as what the debtor will do. Unfortunately, that is where the simplicity ends. Right from the outset of the agreement, before the first paragraph even begins, there is a discrepancy within the document. Everything starts properly with the caption United States Bankruptcy Court, Northern District of Illinois. Just below that, the heading is entitled “rights and responsibilities agreement between Chapter 13 debtors and their attorneys.” Just below that in parentheses, it reads (court approved retention agreement, use for cases filed on or after September 19, 2016). Is it a rights and responsibilities agreement or a court approved retention agreement? It is also commonly referred to by the judges as “CARA.” Are you starting to see the confusion? In any event, the agreement is broken down into sections. Section A deals with what each parties obligations are to the other prior to the case being filed. The debtor is to discuss with the attorney the objectives in filing the case as well as providing the attorney with full, accurate and timely information, financial and otherwise, including properly documented proof of income. The attorney agrees to personally counsel the debtor regarding the advisability of filing either a chapter 13 or a chapter 7 case, discuss both procedures as well as non-bankruptcy options with the debtor, and answer the debtor’s questions. Counsel must also personally explained to the debtor that the attorney is being engaged to represent him or her on all matters arising in the case, as required by local bankruptcy rule, and explain how and when the attorney’s fees and the trustee’s fees are determined and paid. The attorney will also personally review with the debtor the signed and completed petition, timely prepare and file the debtor’s petition, and explain to the debtor how, when and where to make the necessary payments. Lastly, counsel will advise the debtor of the need to maintain appropriate insurance. Section B deals with the debtor’s obligations and the attorney’s obligations after the case is filed. The court highlights nine paragraphs for the debtor and 17 paragraphs for counsel. Section C deals with termination or conversion of the case after entry of an order approving fees and expenses. The court wants to clearly point out that if a case is dismissed after approval of the fees and expenses, but before full payment of the allowed fees and expenses, the order entered by the bankruptcy court allowing such fees and expenses is not a judgment against the debtor based on contract law or otherwise. The judges had a concern that an order for fees in bankruptcy court could be used by debtor’s counsel in an effort to collect unpaid fees in state court. Section D deals with retainers and previous payments. The attorney may receive a retainer or other payment before the filing of the case, but may not receive fees directly from the debtor after the filing of the case. The agreement also specifies that prior payments may be treated as an advanced payment retainer provided counsel explains the special purpose needed for the advanced payment retainer. Further, the court wants to know why such a payment is advantageous to the debtor. Section E deals with conduct and discharge. If the debtor disputes the sufficiency or quality of the legal services provided or the amount of the fees charged by the attorney, the debtor may file an objection with the court and request a hearing. On the other hand, if the attorney believes that the debtor is not complying with responsibilities under the agreement, or is otherwise engaging in improper conduct, the attorney may apply for a court order allowing the attorney to withdraw from the case. Lastly, the debtor may discharge the attorney at any time. Section F deals with the allowance and payment of attorney’s fees and expenses. This is the section where the debtor’s counsel states precisely what the debtor will be paying in terms of fees and expenses. Counsel must also advise the court as to how much has been received, how much is still due and owing for both fees and expenses. Lastly, the debtor and counsel sign at the bottom of the page and it is dated. This agreement is then made a part of a fee application and/or filed with the court so that it may be reviewed by the court. The real issue here in terms of timing, is that there was only a seven day lead up to the required use. 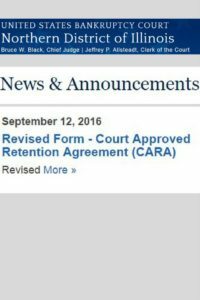 If counsel wants to get paid, the new court approved retention agreement must be utilized. There are likely thousands of cases in the process of being filed under Chapter 13 that have the prior agreement signed and ready to go. For every one of those cases, for every firm or solo practitioner who practices chapter 13 bankruptcy law before the Northern District of Illinois judges, a new retention agreement must be executed. Now this may not sound like a huge, drastic deal. However, when you take into account that many chapter 13 bankruptcy cases are filed in an expedited fashion, the ability to re-circulate documents can be thwarted by the lack of time. Clearly, the judges could have granted a grace period in excess of seven days. Further, the judges could have had the effective date start on the first of the month as opposed to September 19, 2016. I was curious as to whether or not this was a clerk matter. That would somewhat assuage my concerns that there was no real knowledge concerning the time of implementation by the court. Unfortunately, the clerk confirmed that the directive came directly from the judges. To my colleagues who practice chapter 13 bankruptcy law before the Northern District of Illinois judges, heed this warning. Follow the directives pertaining to the new retention agreement, despite the difficult nature in having it implemented. If not, your fees will be denied. Sometimes they will be denied without explanation. You will be looking at your file, staring at a model retention agreement and wondering what in the heck went wrong. Your error will be simply utilizing the outdated retention agreement. Additionally, you will have failed to utilize the current agreement hastily required to be used by the court. I seriously doubt that such an important document with regard to getting paid as debtor’s counsel would have been applied evenhandedly to the chapter 11 debtors’ bar.